We are offering Heat Shrink Tunnel. Roller Conveyor with optional variable speed. Offers neat, clean and wrinkles wrapping. Takes the shape of your product with complete transparency. Enhances sales appeal, cuts down packaging cost, prevents pilferage. Since its incorporation in 1999, Manilal Pack Plast Private Limited is one of the leading suppliers and exporters of a wide range of Packaging Machines across the globe. 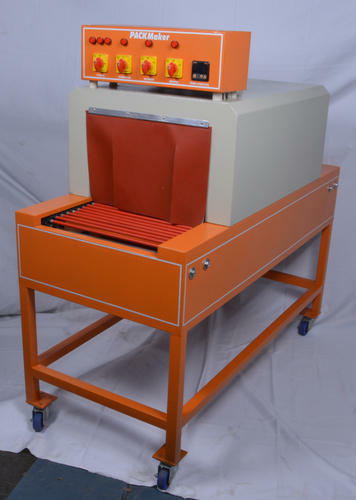 Our product range consists of Case Sealer, Strapping Machine, Shrink machine, Continuous Bag Sealing Machine, Battery Operator Tool, Manual Strapping Tool, and Pneumatic Strapping Tool etc. These products are procured from the faithful vendors in the market. Our vendors use best quality tested raw materials to manufacture these products. These machines are used in various industrial applications. We offer these products customized according to client specifications. We have a team of quality analysts to check the quality of our products. By the industrial experience and expertise of Chairman Mr. Jitendra Shah to understand the requirements, preferences of the clients , the firm has achieved greater heights and has became a reputed brand in the market.